Two years ago, on the 30th of May, I arrived in Delhi to start a new innings of my life after completing my graduation. I was there to start my preparations for civil services. This is the concluding post in the series of three where I am reliving those initial days by reproducing the diary entries I made on those days. Before you read this post, it will be nice if you read the previous two(Part-I and Part-II) for the sake of continuity and to make sense out of this one. Here, I reproduce my fourth diary entry. Read on! I skipped a day, I know! The frequency, I believe, will go down as I am not in a habit of making diary entries. Nevertheless, I am back today. Yesterday, we started with Public Administration course. Language being used by Sir was technical, not a problem to me, but I could see many blank faces. I hope my face doesn't turn blank this early. There's an aswer answer we have to write as an assignment. Will do that shortly after the lunch. In G.S., we started with Science; Physics to be precise. It was a kind of revision class for me of what all I studied during my preparation for AIEEE, 5-6 years back. I am looking forward to Biology and Mental Ability part in Science. While returning, we also got issued for us, the Metro Train passes. By the end of the day, it already had a deficit of Rs. 27. I walked a lot yesterday. First from Karol Bagh station to the hostel which is very tiring under the noon sun. Then, in the evening back to the station as we (I along with Arun, Narendra(Nainital), Abhinav(Raipur) and Robby) planned to visit the India Gate. Walk from Central Secretariat Station to our destination and back was very long and tiring. But talking and knowing more about each other, we managed to tread along. We sat for some time at India Gate. These days, I have been eating just too much, more than twice my normal diet, I believe. And of course, drinking a lot too, I mean water! Anyways, going for lunch right now. I skipped the breakfast as got up pretty late, it being Sunday morning. My apprehensions about my frequency of writing, as revealed in the very beginning, proved right. This happened to be my last diary entry and with time I totally lost track of my 'Dear Diary'. Reasons behind it are not far to fetch. One, I got busy with my coaching classes. The initial 4 1/2 hour schedule got extended to 7 hours and eventually to 9 1/2 hours as the date set for the course's conclusion approached and the syllabus meant for completion kept piling up. Two, I made some good friends. Top on the list was Arun bhaiya. Then there were Narendra Singh Bisht and Abhinav Agrawal both from Law background and room partners. We four formed a close group. Rajesh(the talkative Hyderabadi mentioned earlier) and Devendra (a Marathi fellow from Nagpur whom we named dhila due to his perpetual laziness) were also good friends and so was Vijay who happened to be a Delhiite but had put up in the hostel to concentrate on studies. It's a different matter that most of the times he was back home as the poor guy could not cope up with it. However, when he was there, he was a great help as he usually gave us a free ride back and forth, the institute and the hostel on his Honda City. Otherwise, our mode of transportation was Metro in the evening/afternoon(depends upon when we got free) and in the morning it was initially by bus, though soon we switched to auto rickshaw(which costed additional Rs.5 per head). The reason I mention the amount is because we were very particular about the money initially and tried to save as much as possible. But with time, we had to give in and give priority to our comfort and health. With time even those tiring walks from the Metro Station to the hostel, mentioned in the diary entry, gave way to a cycle rickshaw. Talking of health, I have also mentioned about my increased diet in Delhi. With time, I actually started hating the food being served. The aloo paranthas, I praised earlier gave me a nauseatic feeling at times and the tea felt more and more watery and syrupy. Same was the case with other Nirman 'delicacies'. However, I still kept eating a lot. I still find it difficult to comprehend this paradoxy. On returning to Chandigarh, my mother was amazed at my increased capacity to devour the food. However, she revealed this only when I was back to my normal diet eventually. 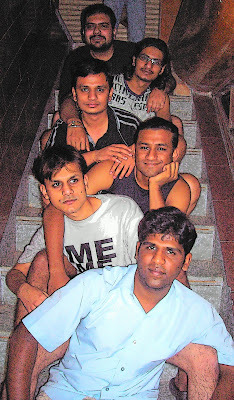 From Top to Bottom- I, Narendra, Arun Bhaiya, Devendra, Abhinav and Rajesh sitting on the stairs of Nirman House during our last few days in Delhi.